Having gone through the end of marriage is tough and mentally tasking. Your personal identity gets reformed and priorities in life change. 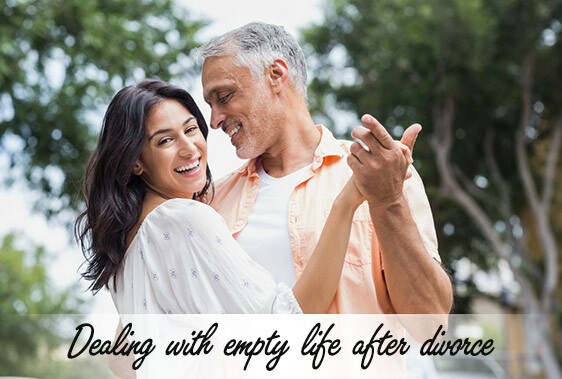 You are left dealing with empty life after divorce. It is natural to feel depressed and at times you miss the good times, in the past spent with your ex spouse.Grief is normal for people who have gone through divorce recently. Give yourself time to heal. Dealing with empty life after divorce is hard yet, at times you may feel the freedom, peace and independence. Accepting your new life and moving on is the best thing you can do to yourself. The sooner you come to the realization that life can be better after divorce is a progressive step towards a new life. You can stop feeling life is empty after divorce and move on to fulfilling and a happy life. It’s something which has happened in the past and you’ve learnt from the experience. Find a hobby that interests you for which you had no time previously. Indulging in a creative writing or sports can be fulfilling and rewarding. If you have a passion for traveling it would be ideal to visit places of interest. Exercising in gym taking yoga classes or learning to play new sport will improve your mind and body. Eating well nutritious food taking care of yourself will help in becoming a confident person who is ready to start a new life after divorce. You are starting and creating a new life for betterment after divorce. Dwelling on the past won’t get you anywhere.You can begin to make necessary changes to your life as you feel appropriate. There is a life waiting for you which is meaningful and a happy one. Trust me asking for help from family and close friends is good choice. Inviting people over and getting to know new people can have benefits. You never know, a new relationship can develop. Keep your eyes open and be receptive. Try US Muslim matrimonial or US Hindu matrimonial site. You may have heard that good friendship leads to lasting relationships. Learn to accept your life after divorce. New adjustments will help you to deal and move forward in life.